Conditions climatiques idéales toute l'année et durant les vendanges. 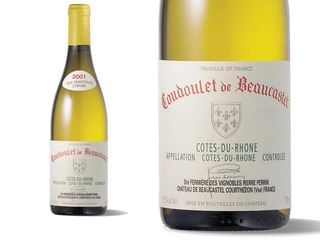 Readers seeking more reasonably-priced whites need look no further than the 2001 Cotes du Rhone Coudoulet blanc. A blend of 30% Viognier and 70% miscellaneous white varietals, this elegant 2001 is filled with characteristics of lychee nuts, minerals, apricots, and pineapple. Made in a fruit-driven, medium-bodied style with surprising delineation, it should be enjoyed during its first 3-4 years of life.